Garrett Dickerson catches a pass. The senior said Northwestern held a “constructive” meeting in which it discussed entering Saturday’s contest with locked arms. Last Sunday, national anthem protests and demonstrations of unity permeated NFL action. 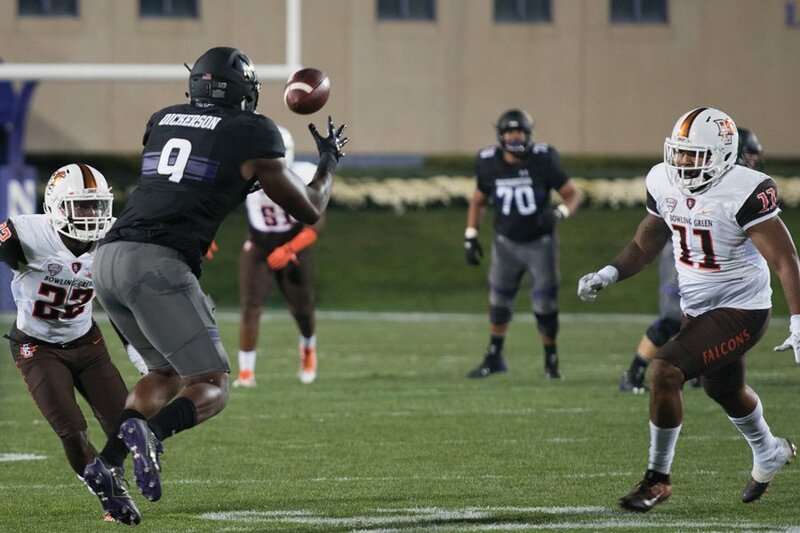 On Saturday, Northwestern will join the conversation with arms locked when it takes the field against Wisconsin, athletic department spokesman Paul Kennedy confirmed to The Daily. Though the Wildcats will not be on the field for the national anthem — a common occurrence for teams at Camp Randall Stadium — the players have decided to enter with locked arms, the Chicago Tribune reported Wednesday. Senior superback Garrett Dickerson said Tuesday the team had a constructive meeting in which it came to the decision. Last weekend’s protests came in response to President Donald Trump’s criticism of NFL players who kneel during the national anthem. Professional teams reacted in various ways, including kneeling, locking arms and refusing to stand on the sideline during the anthem. Coach Pat Fitzgerald expressed his support in the Tribune for his players’ decision and referred to them as “the leaders of tomorrow.” Coaches and staff will also lock arms alongside NU players Saturday, according to the Tribune. Amid a tense political climate, Dickerson said he was comfortable taking a stance at the University. The Wildcats’ conference opener in Madison, Wisconsin kicks off at 11 a.m. The following Saturday, they will return to Evanston where they routinely take the field for the national anthem.